Larger bathroom spaces combined with the trend towards spa-like, luxury bathrooms in which individuals can relax, unwind and rejuvenate has resulted in new products that make these rooms more than just functional spaces. Bathroom vanities with furniture-like styling, deep soaking bathtubs, whirlpools and state-of-the-art steam showers can instantly transform an ordinary bathroom into a unique, beautiful and tranquil space. Many who design bathrooms with luxury in mind also look for other ways to make these rooms more inviting for their users. Steam showers often include spa-like options such as aromatherapy, CD connections, iPod hookups, telephone receivers, timers, benches and acupuncture massage. 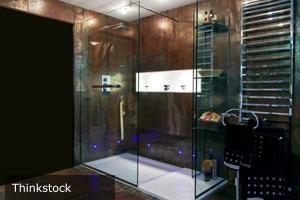 Others incorporate music into a bathroom by installing sound systems complete with waterproof speakers. These speakers are often the same ones that are designed for outdoor use and can withstand the high humidity of a bathroom environment. According to NouveauBathrooms.com, speakers such as the Algonquin speakers by Axiom are ideal for bathroom design because they feature award-winning sound quality and won't be affected by moisture. In addition, they are made with plastic-covered gold-plated binding posts that won't rust and are available in four different finishes to match any bathroom décor.